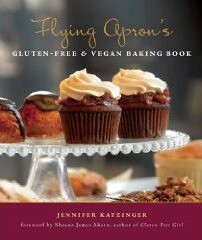 The kind folks at Sasquatch Books have given me an advance copy of Flying Apron‘s Gluten-Free & Vegan Baking Book. Even better, they’re giving a copy to one of my lucky readers as well! The cookbook is filled with all kinds of yummy recipes–muffins, scones, cakes, and even soups and main dishes. Contest ends at 11:59 p.m. PST on Sunday, December 15, 2009. One winner will be selected at random on Monday, December 16 and contacted by email shortly thereafter. Please note this contest is only open to residents of the U.S. and Canada. Hi there ! I live in Auckland New Zealand ! yes all the way down there !! I work for weight watchers , funny ahe , that I would love baking !!! hahah I just read that its open only to residents of U>S>A and Canada , whoops & sorry !! Really enjoy your blog. I have found so many wonderful recipe to bake up and share with guests I host, as I am always hosting. My husband is a minister and we seem to always have someone over. We live in central PA. I am currently spending my time raising our two wonderful boys who love the food I make them. Hi! Love your site. It’s been really helpful in keeping up with my west coast “family” – we aren’t truly related but they invite us for major holidays, and they all cook and bake like pros! I’ve been unemployed for a year after working for several years on home improvement shows. The industry took a big hit with the recession, but now, I’m about to have my first baby. Raising him will be my new job for the time being. 3 weeks to go! p.s. I live in Sherman Oaks, CA. Hi! I am an athletic and personal trainer. I am also in school full time. Baking is my muse….haha, I mean, really, what inspires me is finding a recipe and making it until its “perfection”. In the process, I relieve a LOT of stress, and garner the love and adoration of clients, friends, and family, who get to be the test tasters! As healthy and tasty as I try to make my recipes, I am clueless about vegan and gluten free….I have a sis with celiac disease, and my best friend is vegan, so this cookbook would be a great starting point! Maybe even in time for goodies for christmas? I loved the Reece’s Pieces Cookies!!!! I live in a northern suburb of Chicago. I’m a retired school librarian, and am still teaching Sunday School. It’s been over 30 years, and I LOVE it. My signature recipe is Mazel Toffee cookies. I live in northern Ontario, Canada. I love cooking, baking, sewing and painting – all hobbies which occupy my otherwise unemployed day! I live in Atlanta, and I am pursuing a Ph.D. in Hebrew Bible! Another one in a Chicago suburb — but working in the city — library school student, mom, and program coordinator. Hello from Boston, Mass. After being laid off early this year, I am redefining myself trying to make enough to live on! Right now, I’m a baker, a chef, a photographer and babysitter. And actually loving all of it! I live in upstate New York and work for a holistic veterinarian. Cooking andbaking are my favorite creative outlets. i’m in north/central Florida and I do economic development for a living. i love your blog and it makes me happy! I live in Maryland. I am a product manager. That cookbook sounds devine. I live in the Piedmont section of South Carolina and love your recipes!!! I live in Melbourne, Australia and I am currently a student studying fine arts and education. I work part-time for a tutoring organisation doing boring administration work … but like to light up the office with baked goods! I would love to tackle the recipes from this book cause a few of my colleagues are either vegetarian or celiac or some other kind of intolerant!! And they are my taste testers — or rather who I give my baked goods to so I don’t eat them all! Keep up the blogging! I have been a long time reader, first time commenter. I live in Ypsilanti, MI. I am an unemployed archivist:P That sounds great doesn’t it? While I look for a job I work as a mom to my 3 year old and 1 year old boys. Love your blog! Thank-you for your website and recipes, I do enjoy the recipes but unfortunately all my baking and some of my cooking is a vicarious pleasure. (I am Real Estate Development Project Manager living in Long Beach, CA; ‘not-too-many-projects-to-the-pound’ at the moment – so I’m “consulting”). I have loved many of the recipes from your blog. My occupation is a real estate professional, homeschool teacher to my 2 daughters 5th and 7th grade, medical transcriptionist, and a stay at home mom and wife. I’m in the Detroit metro area finishing my Ph.D. in Anthropology. I’m currently dabbling in raw and vegan food. I’m a long time follower and former blogger! Hello! I live in New York City and go to graduate school at Columbia University in their anthropology program. I’m also an intern at the Ellis Island Immigration Museum. Love your site! hi! i live in colorado and i work at a university! i teach and also work with survivors of interpersonal violence & sexual assault. I live in Southeastern Oklahoma and I am a Home Health Provider. This cookbook looks great. I do a lot of cooking for my clients, and I like for the food I cook to be healthy, yet still tasty. Thanks for the opportunity to enter my name. I’m a student from Oshawa, Ontario, Canada! I’m jobless so I enter internet blog contests for a living. Hii! I live in NYC, but am currently in Taichung, Taiwan working at a large wedding banquet hall in the kitchen. I’m gonna go back to NYC to study pastry arts at FCI, and I have hopes of opening up my own place someday 🙂 This cookbook would be a great help to me in my endeavors! Hi there! I’m originally from Malaysia. My family just moved to MN last summer. I’m in 10th grade right now. I’m a stay at home mom from Minneapolis. Thanks for the giveaway! This would be good for my son who is allergic to almost everything. Haha! Thank you. i’m exploring vegetarianism so would love to have more resources to help me along. i’m from vancouver, canada and i work in higher education. I live in Salinas, California. And I’m a data manager/analyst. If i won this, I have a coworker I’d give it to! He recently found out that he has celiac, and is learning the ropes of gluten free cooking! Oooo what a fun giveaway! I’d love to try out some gluten-free and vegan recipes! I live in Nashville and am an accountant. This sounds stunning. I live in the Boston area where I work in a library. Ooh awesome book! I cook gluten-free, and surprising to me, my top 2 blog posts are both vegan. Maybe my readers are telling me something! I am in the Dallas area and work in a credit union as a compliance manager. I live in Utah and work for a software company. During this time of year, I am making candy in my spare time and packaging it up as gifts for co-workers, friends, and family. Hi! I am a teacher in Edmonton, Alberta, Canada. I See you have one other reader from Edmonton. Baking is my form of relaxation. Thank you sharing your recipe finds with us. I live in British Columbia and I’m mostly a homemaker. I live in Rochester NY. Before I was a Medical Social Worker and Therapist. I live in NE Kansas. I do books for my dad’s construction business. I live in Washington DC and I’m a student (with celiac disease, actually–so I’d loooove to win this book!). I live in New York and am a student! I live in Hillsborough North Carolina, I am primarily a stay at home mom but am able to get out of the house and wait tables at my favorite restaurant a few nights a week! I’m from Auburn Hills, MI. and currently unemployed due to a car accident. Thank you for the chance of winning your giveaway. Hi. I live in sunny FL and run a children’s dance studio. Fun! I love your website and recipes! I live in Salem, Oregon where I do accounting for a CPA firm. I work with a man who can’t eat glutan so this cookbook would be a perfect way for me to share goodies he can eat too! I hail from Rochester, NY and am currently a full-time parent. I live in a little village in England called Wollaston, and I work for the local government, with local businesses and farmers! I crave to be a full time domestic goddess, but have bills to pay, boo!!! Hiya! I live in West Hills, CA and am a stay at home mom and homeschooler. My munchkins are used to “mommy-made” goods as well as my gluten intolerant hubby. I am personally in love with your Brown Sugar Pound Cake! Hey! I live in just outside of Vancouver, Canada. As for my job, I work with books which helps when it comes to finding new recipes and cookbook releases. Hi! I live in Huntington Beach, Ca. I love to bake, and my hubby and friends say my kitchen talent only improves with each meal. Cooking can sometime be tricky for me since I have several food allergies, but I make it all work. I work for the electric utility, SCE where my coworks look forward to “aloha fridays” which is when I bring in baked treats to share. I live in a small town in New Jersey right to NYC! I live in New York and I teach elementary school children and I love doing it. My husband eats gluten free which makes me especially interested. After all, I do the baking. I’m originally from Vancouver, BC but right now I’m living and going to school in Milwaukee. I really enjoy your recipes – thanks! I’m an attorney (prosecutor) in San Francisco, and live in El Cerrito (near Berkeley). I just stumbled across your blog and I’m fascinated! As a diabetic [type 2] I am also looking for low carb and sugar free recipes… Mostly it’s one or the other when it comes to baking! Oh yes, I live in Eugene, OR [go ducks!] and I am a retired Exec. Admin. in the electronics industry. most of all a bread baker and dog walker! what’s a girl to say? I love to cook. love to eat. love to feed others! In the winter, I cook so that my home will smell good…cinnamon, cardamon, curry….mmm. Hi! I live in New York and work at an art gallery. Thanks for the giveaway! I live in Parker, Colorado about 20 miles south of Denver. I have a great job – I own a doggy daycare and boarding facility. I live in southern NJ, outside of Philadelphia, and I am a teacher. I’m a stay at home mom for my 3 years old Sarah and other 3 girls go to school. My husband works part time outside and will be laid off on Jan 1. Sarah was just diagnosed with Celiac Disease. I’m always looking forward for different ideas. Sarah has sweet tooth, and she always sneak in and steal the food she was not suppose to eat. lol. Looking forward to this Monday and see who win. Thanks..
I’m currently living in Cleveland, OH. I work part-time in retail; but I graduated from law school in May and am hoping that soon I’ll be able to find a job as an attorney. Thanks for the opportunity to win! I am an actuary (plays with numbers??) and live in near Allentown PA. Also, mom to a dog & four cats, all rescued from the street or shelter. I was so happy to find a place that has original recipes. I love to be in my kitchen where I spend alot of my time. I am a military wife, mother, and EMT. I love to find a good recipe to help me unwind in the kitchen. I love the brown sugar cookies!!! I live in Arizona, and I work for a law firm. My birthday is Wednesday, so I hope that lil bit of birthday magic will help me win! !